Before we can submit your claims to the Ministry of Health, you need to authorize Dr. Bill as a Designee. You can have several designees, so this process won't affect any existing billing arrangements you have. If you don't have a Go Secure login you'll need to setup your account, see the instructions here. Follow steps 1-4 below which initiates the designee request. 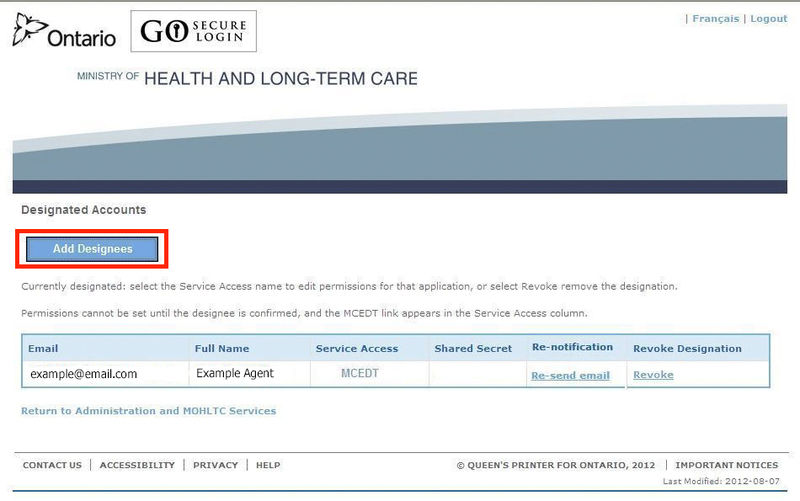 Now you'll need to wait for us to accept your request (under an hour during regular business) at which point you'll get an email from OHIP telling you it's complete. Unfortunately this is a bit misleading, as you now need to log back into your Go Secure account and complete steps 5 & 6 before we're fully authorized to submit your claims. 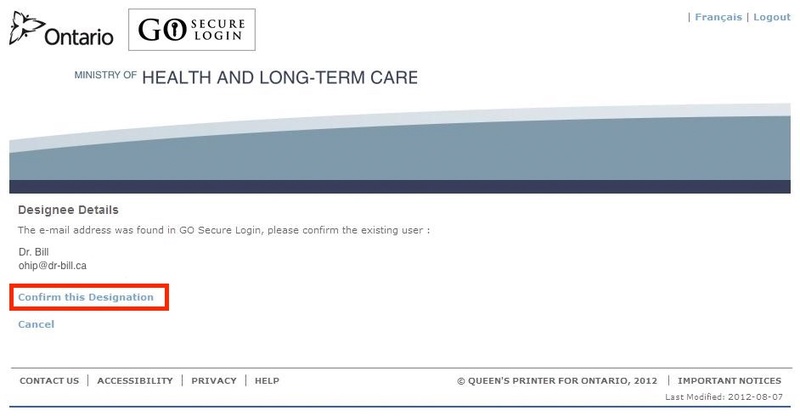 Log-into your Go Secure account at: https://www.edt.health.gov.on.ca/ and click on Designee Maintenance (Add, Remove, Update). Click the Add Designees button. 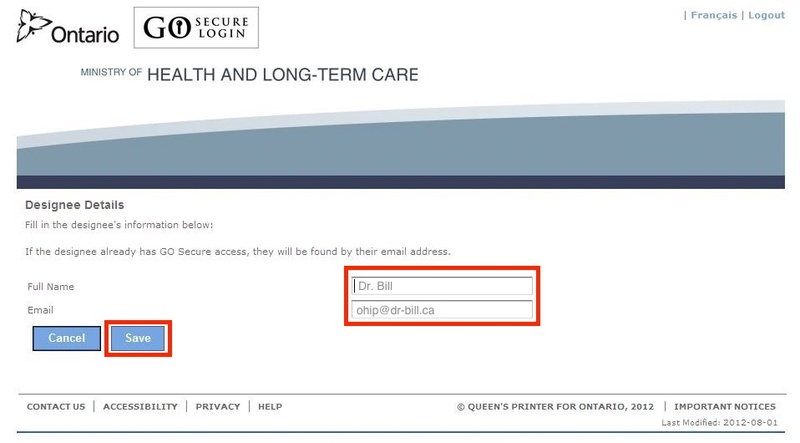 Add Dr. Bill as a Designee using the email address ohip@dr-bill.ca. You'll be asked to confirm the Designee you just added. Just click this option highlighted below. After you complete Step 4 an email is sent to our team by OHIP. We have to confirm your request to add us as a Designee. If you've initiated your request during normal business hours this happens within an hour. On evenings & weekends it will take longer, but no more than 24 hours. After we confirm your request OHIP will send you an email notifying you that we've completed the designee process. Click on the link in this email and log back into your Go Secure account and complete Steps 5 & 6 below. Follow the link in your email back to the GOSecure website and navigate back to Designee Maintenance. You'll see a table with a list of Designated Accounts. 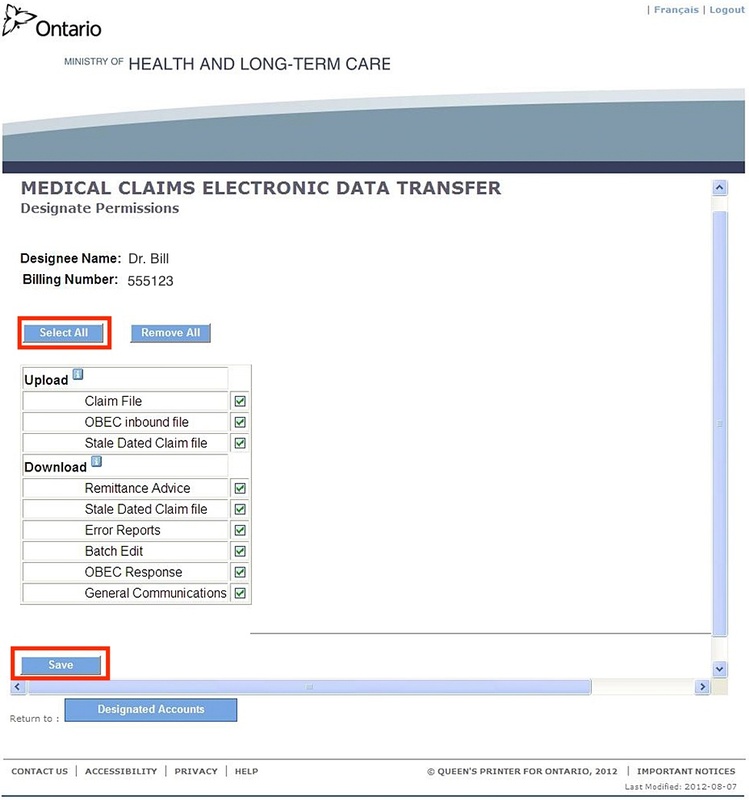 Click on the email address 'ohip@dr-bill.ca'. This links you to the next page. You now need to give us permission to submit claims on your behalf. Choose the Select All button, then Save at the bottom of the page. You're done! 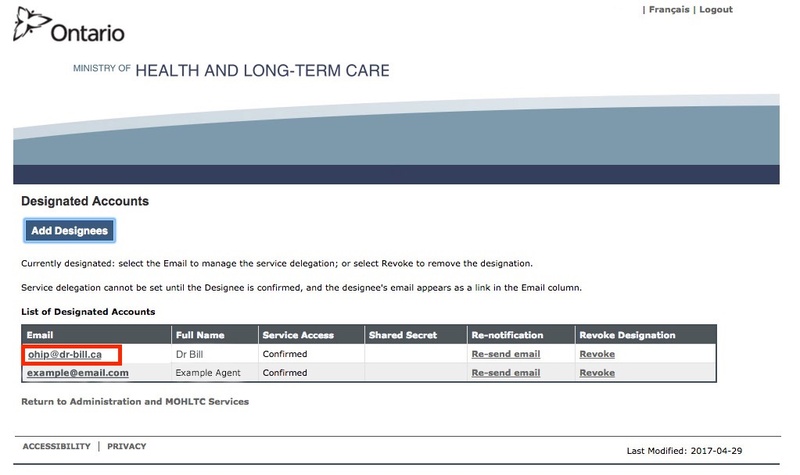 Our system will send you a final confirmation email indicating your connection with us is complete. This email is sent once a day, so it can take up to 24 hours to receive it. If you don't receive it, get in touch with us by initiating a chat using the chat button in the bottom-right of the screen.